Common Acronychia ( Acronychia oblongifolia, RUTACEAE ). 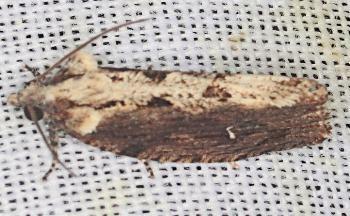 The adult moths have forewings that each have a complex brown pattern including a small white tick near the middle. The males and females have slightly different forewing patterns. The hindwings are plain brown, fading toward the bases. The wingspan is about 2 cms. CSIRO Publishing, 2006, pp. 1, 83-88.